This month the FCC published a white paper to discuss its findings that we need more broadband spectrum in the United States to handle the growing demand for wireless broadband services. The paper, entitled Mobile Broadband: The Benefits of Additional Spectrum, starts out with some interesting statistics for commercial broadband usage and demand. The Public Safety and Homeland Security Bureau could use the material in this paper to reevaluate its stand on the auction of the D Block. Based on these numbers and realizing that demand for data services within the Public Safety community will grow at least on a par with what is happening in the commercial world, thus the 10 MHz of spectrum currently allocated to Public Safety is not sufficient for the volume of data its agencies will be needing, both for day-to-day use and in emergency situations. This paper is well done and includes many statistics that if interpolated to Public Safety will prove once and for all that 10 MHz of broadband spectrum is simply not sufficient to handle its needs. It should also be noted that the demand for broadband data has been growing over the past three to four years and continues to double every quarter. Since Public Safety has not had access to wireless broadband except on commercial 3G networks, its adoption rate will exceed what the FCC reported for commercial networks because Public Safety will quickly find better and faster ways of serving the public that will save lives and property and help better protect those in the field. This report is well worth reading as it is one of the best on the subject of broadband demand and capacity I have seen. Those within the FCC who authored this report are to be commended. Now these same findings should be applied to measure the demand for Public Safety broadband. This type of growth and demand is well understood; building one network on 10 MHz of spectrum and then having to go back only a few years later to build an additional network on some other portion of the spectrum is a counter-productive and costly proposition. I contend that if the information on both demand and capacity are valid for the commercial industry, they are equally valid for the Public Safety nationwide interoperable broadband system. For example, according to the FCC’s own reports over the last six months, the number of subscriptions for mobile data services has increased 40% and wireless broadband demand has grown more than 450% between the first quarter of 2009 and the first quarter of 2010. The FCC provided the chart reproduced below to show that today’s mobile data user consumes more than 200 megabytes of data per month. 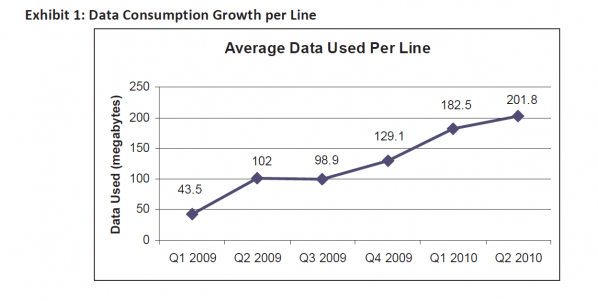 A range of recent wireless industry trends indicate strong growth of mobile data usage. AT&T, the exclusive US carrier of the iPhone, has seen mobile network traffic increase 5,000% over past 3 years. Users of Clearwire’s fourth generation (4G) WiMAX service consume 7 GB per month — 280 times the amount of data used by a regular cell phone. And finally, it the chart below to show the growth of wireless broadband traffic between now and 2014 as forecast by Cisco, Cody, and The Yankee Group. The year-over-year growth is shown almost doubling and then more than doubling. I believe all of these numbers are valid, and all of them prove that the FCC is correct in its assumptions that more broadband spectrum is needed in order to meet the increasing demand for wireless broadband services. The paper goes on to state that finding and auctioning this spectrum will result in more than $100 billion in auction revenue for the Federal Government and that this spectrum will help the United States meet the huge demand for mobile data services. This report is well done and goes on to provide interesting data about the types of devices that will drive this increase in demand, the type of data used by each type of device, and how many of each type of device will be in use in 2014. It then switches to the number of cell sites in use in the United States, showing that as of the end of 2009 there were a total of 245,912 cell sites in use (all operators), and that this number is growing by about 7% per year. Then the paper delves into spectrum efficiency. It is interesting that it states that the downlink spectral efficiency of LTE is between 1.36 and 1.5 bps/Hz (bits per second per Hertz of spectrum). The recent T-Mobile white paper on capacity that was submitted in an attempt to prove that 10 MHz of spectrum is enough for Public Safety, the authors used a spectral efficiency of 2.0 Bps/Hz. I stated in my response that this was too high and that 1.3 bps/Hz should have been used. The FCC itself validates my position that the T-Mobile white paper was based on inaccurate information. Another interesting point is that the FCC’s spectrum efficiency calculation was based on 2X10 MHz of spectrum or 20 MHz, which is what Public Safety is asking for, once again adding validity and solid data to prove that Public Safety needs the additional spectrum. As the paper develops, the authors show that by 2013 (only 3+ years from now) the spectrum deficit for commercial systems will be -90 MHz and -275 MHz by 2014. If we apply this projection to the Public Safety spectrum allocation of 10 MHz of spectrum and use the same data growth rates, it is clear that the Public Safety deficit will be proportionally the same. This should be sufficient reason for PSHSB staff to reevaluate their position on reallocating the D Block to Public Safety. By 2013, many of the commercial networks will have deployed all of their 700-MHz LTE spectrum and the projected growth for data for all commercial spectrum will be more than 3500% what it is today. This huge demand is forecast because there will be more smartphones, tablets, notebooks, machine-to-machine, and other devices as well as many new types of applications. A majority of this projected growth can be attributed to increased use of video and other data-intensive applications, just like in the Public Safety broadband spectrum. Again, the data provided in this paper proves to me beyond any doubt that Public Safety needs the D Block reallocated to Public Safety now. Another point that is brought home by this report is that since commercial network operators will be out of spectrum by 2013, the PSHSB belief that Public Safety will be able to roam with priority on the commercial networks must be questioned. The report shows that between 2010 and 2013, demand for data will grow by more than 2000% on commercial networks and network operators will be struggling to provide the bandwidth their customers demand. Even with some type of priory roaming agreement, commercial network operators are in business to make money and to serve their customers the best they can. They will be concerned with managing traffic on their own networks and will not be in a position to have some of their spectrum assigned to Public Safety in an emergency situation when voice and data demand over these commercial networks will be higher, let alone on a day-to-day basis. This paper provides the type of analytical analysis the Chairman said he would use in the FCC’s decision-making process going forward. Given the information in this report, I am calling for the PSHSB to re-evaluate its position on the D Block allocation. This paper proves beyond any doubt that the demand for broadband services is quickly outpacing network operators’ ability to provide that capacity. Further, the FCC plan, which envisions 44, 000 cell sites for Public Safety and provides what it believes is a vehicle to fund the build-out of these sites, does not take into account that the commercial industry is adding cell sites at an average of 7% a year, primarily to increase capacity. Translating this to the Public Safety network means Public Safety should be adding more than 3,000 new cells sites every year, a cost that was not included in the FCC’s plan to fund the Public Safety network on a nationwide basis. This paper also states that the value of the new spectrum if sold at auction will be more than $100 billion. This means that the $3 billion that would be raised (if that much) by the D Block auction represents about 3% of the total revenue expected. If we equate that to paying off the national debt, which is growing by $4.5 billion a day, the D Block auction would pay for less than one day of debt reduction. However, if it is reallocated to Public Safety, for the first time, Public Safety will have enough spectrum to add services never before possible—services that we, as citizens, already enjoy. This paper clearly proves beyond any doubt that allocating only 10 MHz of spectrum to Public Safety is shortsighted and will end up costing taxpayers even more money when the FCC needs to allocate more spectrum (as predicted) in some other portion of the band, meaning a new network would have to be built and new devices would have to be designed to support both bands deployed. Moreover, using two different portions of the spectrum does not provide for enough contiguous bandwidth for applications used by Public Safety even during day-to-day operations. It is difficult to imagine that while the FCC on the one hand is predicting that demand for broadband services will skyrocket in the commercial sector, it is still holding onto the mistaken belief that 10 MHz of spectrum is all Public Safety needs now and well into the future. The other proposal the PSHSB is floating is to permit the use of broadband services mixed in with narrowband voice services on the currently allocated Public Safety narrowband spectrum that is also in the 700-MHz band. This would cause undo interference, it would not provide for nationwide interoperability of either voice or data services, and it would set the Public Safety community’s efforts for interoperable voice services back decades. I will certainly be responding to the request for comments before the December deadline. If the FCC and PSHSB need an excuse to revisit their stance on reallocation of the D Block, this paper should pave the way. It provides the kind of data the FCC Chairman has asked for in evaluating the need for new spectrum allocations and it should cause those within the FCC who are still advocating auctioning the D Block to take a fresh, hard look at this issue based on facts provided by the FCC itself.